This little string game was shown to me by a young Irish girl. First: Take one string of the loop between the teeth and let the rest of the loop hang down in front of you. Second: Let the right hanging string lie across the palm of the right hand held palm up, the fingers pointing to the left (Fig. 803); let the left hanging string lie across the left hand held palm up, the fingers pointing to the right. 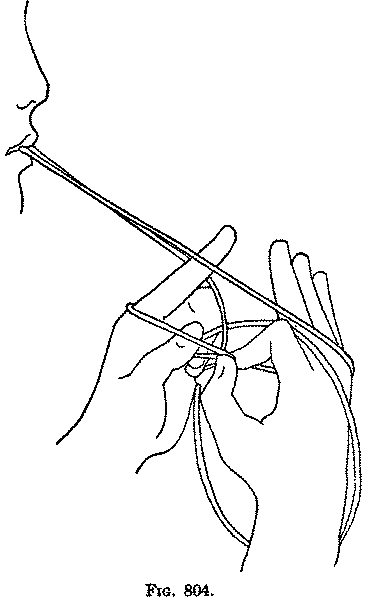 Now holding each string between the thumb and index, close the fingers on the palm, and put a loop in each string, by turning the fist so that the thumb is uppermost and then passing the hand between the hanging string and your body (Fig. 803, Left hand). Third: Exchange the loops held by the two hands, putting one loop through the other (Fig. 804). 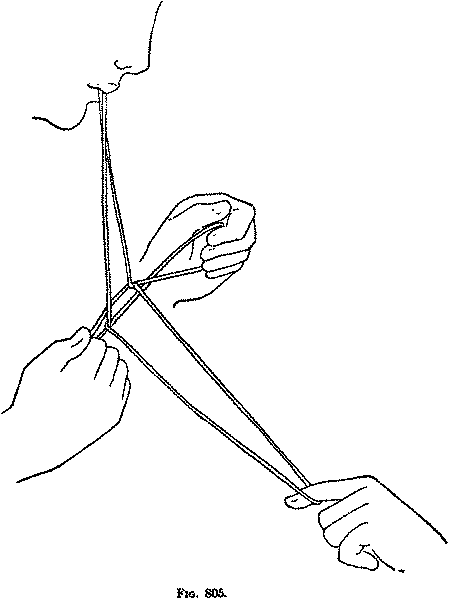 Fourth: A second person now pulls out the hanging loop, and a sawing motion is produced by pulling alternately the loops held by the hands and the loops held by the teeth and the second person (Fig. 805).